The only thing certain about the future is that there is constant change, creating surprises and risks around every corner. This week’s surprise is the financial failure of Wow Air — the supercheap Icelandic carrier that had temporarily given the world “ridiculously low” transatlantic air fares. This is just one example of how change creates surprises and risk. Managing change and risk has always been the realm of insurance. Our industry is adept at helping people to cope and giving them a small measure of security in the midst of an insecure world. Since this world is in the midst of great change, we should also be in the midst of predicting how we can cover these risks and how we can serve those who are taken off guard. Travel is a great place to start. We know that modes of travel are in flux. High speed trains in Florida and California may be the precursors of more train travel. Autonomous technologies may contribute to fewer personally-owned vehicles. Younger generations are renting longer rather than owning a home. Distracted driving is on the rise. The Sharing economy is allowing homeowners to rent out their homes. It is also contributing to a growing delivery market. Do our current insurance products and services match up to these diverse and growing needs? In Majesco’s recent thought-leadership report, Building a Business Model for the Insurance Customer of the Future, we take a close look at how surveyed consumers who make or share insurance purchase decisions perceive their own relationship to insurance. We also examine how up and coming technologies and life trends are set to impact insurance product and service offerings. In last week’s blog, we touched on why business models need to shift to accommodate future customers. In today’s blog, we’ll provide a glimpse into why future products and services must also shift. To do that, we’ll look through at two areas of impact: current and future lifestyles and current and future technologies. Who is buying insurance? 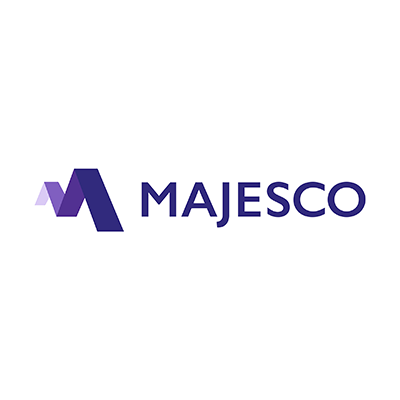 Majesco started its survey with some elemental questions surrounding the purchasing of insurance by generation. 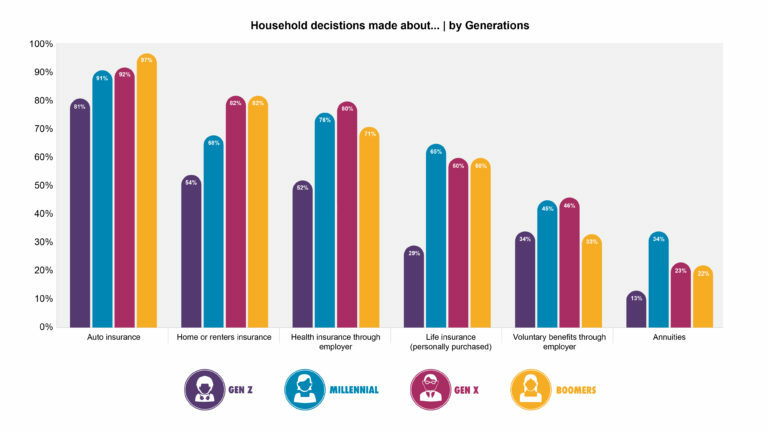 The great news is that Millennials are equal to or higher than Gen X and Boomers in ownership of all types of insurance coverage except home/renters (see Figure 1). Given that home mortgages require insurance coverage, this suggests a high rate of renting (without insurance) among this segment, and a corresponding high market and sales potential for renters insurance. High rental rates are likely a lingering effect of the financial crisis’ impact on Millennials or high college loan debt. The recession is also a likely driver behind Millennials’ high ownership of individual life insurance, annuities and investments, reflecting concern about financial wellness and protection. Gen Z’s lower levels of ownership in 5 of the 6 insurance types likely indicates that many are covered under parents’ policies and plans for convenience or cost reasons. As cloud technologies and subscription-based services grow (and they are growing), future customers are looking for product and service simplification to rid themselves of many different payments to uniquely different entities. Customers will be asking themselves, “Can’t I just consolidate all of these services under the same umbrella so that I don’t have to track every source of recurring transactions?” This could very easily be a disrupter for insurance because some effective consolidators already exist. 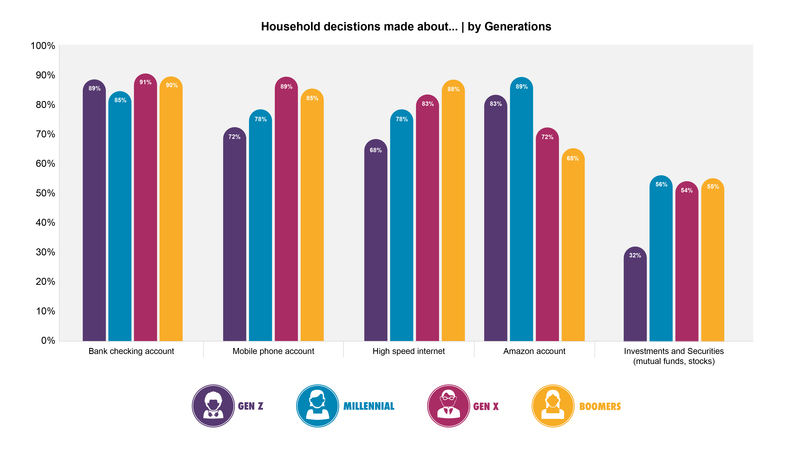 Insurers should take note of the very high penetration of Amazon.com accounts in the Gen Z (83%) and Millennial (89%) segments (see Figure 2). If Amazon decides to enter the insurance market, they have a large built-in base of loyal customers who look to them for nearly everything in their lives. These segments are not “indoctrinated” into the ways in which legacy/incumbent insurance works and they will work with companies like Amazon — whose processes are already making them comfortable in other areas of their lives. Insurance products and services that fit future customers may look much more like Amazon services than our traditional products of today, covering more areas of life with less division between insurance types. Can travel insurance be bundled with life or auto insurance? Should we change the definition of what a “whole life” policy is and what it covers? Platform companies like Fivvr.com and Freelancer.com are empowering people to monetize their talents and passions by connecting them with companies that need their skills for specific projects or for limited term engagements. The latest research by Upwork and the Freelancers Union estimates that 56.7 million Americans worked as freelancers in 2018, an increase of 3.7 million from 2014. [ii] Our research has shown there is a steady range of 10% to 20% across all generations who have worked as an independent contractor in the Gig Economy. Platform companies like Uber, Lyft, VRBO and Airbnb allow people to liberate their assets from the confines of personal use and re-appropriate their time by connecting them with people who are willing to pay to use their assets or services on-demand. Since many personal assets like cars, homes or rooms within homes can include significant periods of non-usage and cost for their owners, these platforms empower millions to earn money at a scale that was never possible before. Our survey confirms that the consumption of services in the Sharing Economy is very strong and growing. 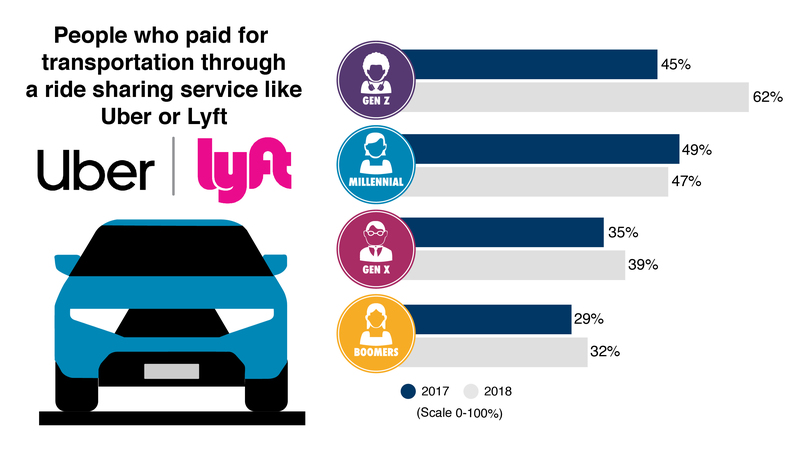 Rideshare services like Uber and Lyft have been the most used by all generations (compared with other sharing economy platforms tracked in our survey), but particularly by Gen Z and Millennials. Gen Z participation jumped sharply from 45% to over 60% this year. Gen Z had a strong bump of 10 percentage points in the use of homeshare services to rent rooms or homes, while Millennials showed a 9-point increase in renting a car through a service like Zipcar or Turo. With this increase in usage, comes an increase in new insurance and risk products. The need for insurance to fluidly switch back and forth from personal use to business use has been a major challenge for the industry. In the U.S., rideshare insurance is available from at least a handful of carriers in every state but there is still an underserved market estimated at 50% of all rideshare drivers who lack coverage. [iii] In some ways, finding products and services that fit the future customer will have more to do with a business model shift than a new product and service shift. The one will have to happen before the other is possible. Coverage for homesharing hosts is slightly behind ridesharing coverage. As the industry has grown, confusion has also arisen over coverage options. The NAIC suggests hosts could purchase a landlord policy or rent only to guests who can prove they have their own homeowners, renters or personal liability insurance. [iv] ISO filed homesharing coverage options in 2016 and a few large companies like Allstate and Lexington (AIG) offer specific homeshare policies. [v] Slice has established itself as the front-runner in this market with its innovative mobile-managed, on-demand, pay-per-use homeshare insurance offering. In many ways, though, this market is still “up for grabs” and could be open to further innovative thinking. How can insurers create a complete insurance picture that doesn’t leave uncomfortable gaps between owners and renters? If insurers are serious about developing products and services that help individuals and businesses deal with the world’s future changes and surprises, they will also be serious about using connected devices and future technologies to mitigate the impact of surprises on their businesses. insurers to begin to protect themselves and their customers. As they use connected devices to develop new products and services, open new distribution channels, improve processes and enhance customer engagement, they will also be using them to predict weather, device failure, health issues and behavioral changes. Connected devices to more than report; they can also provide valuable information and recommendations reduce risk to their covered customers. generations. 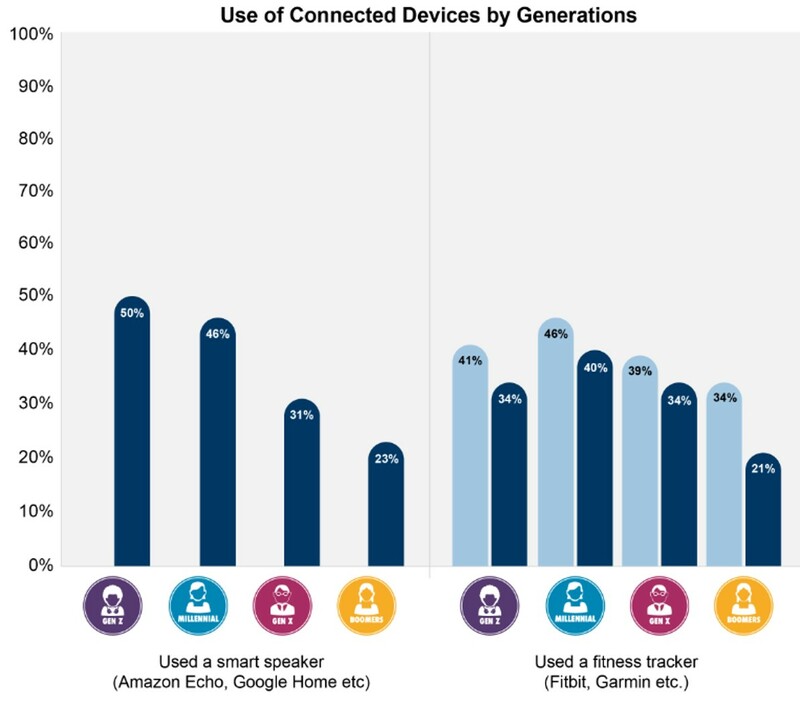 Popularity declined slightly this year, especially among Boomers, but fitness trackers still have one of the highest penetration rates of all connected devices (see Figure 3). 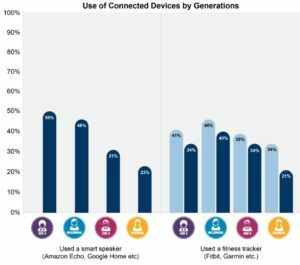 Smart speakers are the new champion in the connected devices category, with nearly 50% of Gen Z and Millennials using them, followed by 33% of Gen X and 25% of Boomers. Research by Adobe shows that 71% of smart speaker owners use them daily, with 44% using them multiple times each day. [vi] Owners are increasingly using them for complex tasks like online search (47%), basic research (35%) and executing smart-home commands (31%). 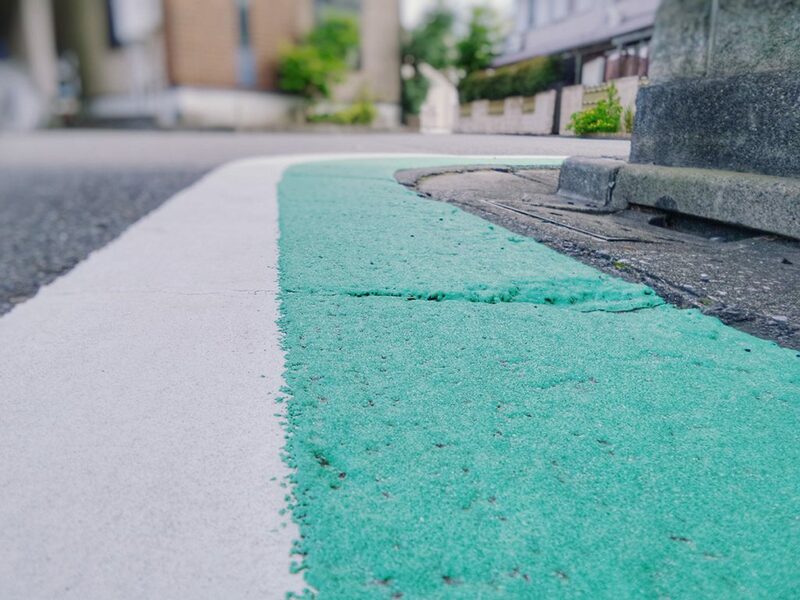 Connected devices and IoT are opening up insurance to large-scale innovations and improvements that we frequently consider under the umbrella of Digital Insurance 2.0. These innovations will not only enhance what insurance already does, but more importantly, they will rewrite the nature of preventative and protective coverage through a digital awareness layer that is brought about by cloud-based digital ecosystems. The power of the digital awareness layer is that it can unify, simplify and break down traditional insurance barriers and open the insurer up to all kinds of possibilities … new customers, markets, products, and partners. To truly grasp future customers and future possibilities, you must first look into the future! And you must have cloud based platforms that can adapt to the continuous changes, surprises and risks with speed. This is why Majesco has been so focused on creating cloud platforms that enable insurers to meet the needs and demands of their current and future customers…so that they are the leaders in the Future of Insurance. Be sure to download Building a Business Model for the Insurance Customer of the Future, to catch a glimpse of the latest trends and their impact. In our next blog, we’ll examine Distribution and Engagement Strategies that will fit your future customers.